This is the fifth anthology of novellas in the series starting with The Mammoth Book of Classic Science Fiction. It includes nothing by Asimov, although it might conceivably include “The Bicentennial Man.” It’s a fairly strong anthology, including as it does stories like Poul Anderson’s “The Queen of Air and Darkness,” Larry Niven’s “Arm,” Norman Spinrad’s “Riding the Torch,” Edward Wellen’s “Mouthpiece” and John Varley’s “Persistence of Vision.” The remaining novellas are good enough, if not quite as good as these, but a bigger strike against this anthology of wonderful longer sf from the 1970’s is its failure to include Ursula K. LeGuin’s “The Word for World is Forest” or James Tiptree, Jr.’s “Houston, Houston, Do You Read?” (both Hugo-winners). 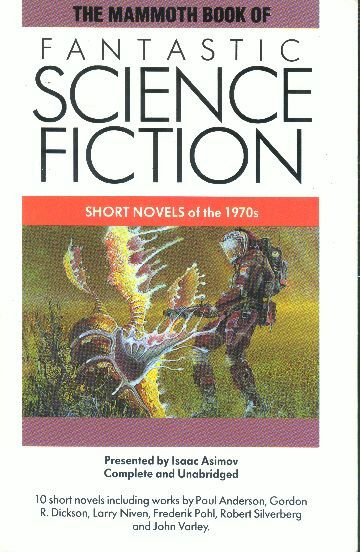 The result is an anthology of very good sf from the 1970’s, but not the best possible.